In 2006, by accident, I came across an article about a certain Dr Naif Al-Mutawa, a clinical psychologist who wanted to make positive images of Islam available, especially to children. 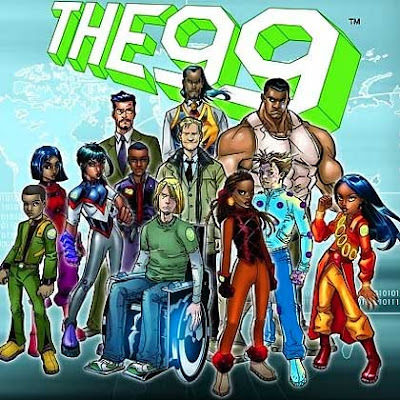 The article explained that Dr Mutawa had created The 99, a group of 99 superheroes whose names and superpowers were derived from the 99 attributes of Allah. Teshkeel Comics had not yet launched The 99 Comic at the time when I was reading this. I had hoped, then, that I was not the only one, out of many non-Muslims living in a non-Muslim country, who could see the socio-cultural value of multicultural superheroes each embodying positive Islamic attributes and together, telling the world about the diversity of Islam. I saw in The 99, an entertaining and colourful concept suited to our increasingly global environment. I also saw, at last, a positive image of Islam (and its history) so long lacking in Western popular culture and in some cases, absent even, from Islamic popular culture. In addition, I admired Dr Al-Mutawa for having shifted the attention from Western-centric paradigms and encouraged the world to embrace the possibility of pluralistic cultures. That was a mouthful. But one better way to describe it, is the response my aunt gave me after I sent her the link to the recently available Endemol Trailer for The 99 animation. Now you must know that my aunt, born in France, is half French and half Vietnamese and is married to an American of Dutch origin. Her children inherit that cultural mix. Meanwhile, like me, she was born in the Roman Catholic Church and like me, she now has no current religious inclination. However, when she read about the concept behind The 99, she was extremely enthusiastic. This, she said, was the kind of media entertainment that she wanted her children exposed to. She wanted her children to grow up in a spirit of tolerance and understanding for many ways of being. She was keen. My aunt does not have a social psychology degree or an understanding of advertising and the media. But she understood that the more we are exposed to something new and unfamiliar, the more we like it... and ultimately seek information to understand it. For too long, non-Muslim parts of the world have been exposed to negative images of Islam through the media. This has created misunderstanding and fear for those in the West who are not exposed to other, counterbalanced realities of the Muslim world. For example, images of oppressed Muslim women are rampant and while this may be true in countries like Afghanistan, this is hardly the reality in many parts of the Muslim world. Meanwhile, Western cultures associate Islam with the Middle East which itself is unfortunately further associated with 'conflict in the Middle East' or extremism. Thanks to the media, being Muslim has also been equated to being Arab. But in fact, there are Muslims in Indonesia, Malaysia and Senegal who are not Arabs. And...there are Arabs, like myself (I'm half), who are not Muslim. Meanwhile, there are important Muslim populations in Russia, China, France, Eastern Europe and Thailand. The trusted eunuchs that Ming China sent to navigate the oceans and collect world tributes in the 15th century were Muslims. And the strong woman who, after the Grenada Caliphate had fallen in 1492, reproached her son with, "You do well to weep like a woman for the city you would not defend like a man", was Muslim. It is almost 2010 and, if you google The 99, you will find that the concept has been welcomed in many parts of the world. I am so glad. 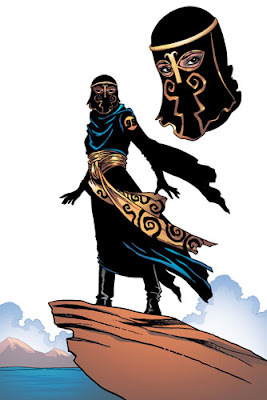 I want to talk about a character that I really like from The 99. Her name is Batina The Hidden. According to articles about The 99, Batina has the power to become invisible. In perfect concordance with her superpower, Batina wears a burqa. Why I love this character is twofold. Firstly, and I write this without endorsing the extremist Taliban in Afghanistan so please do not jump to conclusions, Batina subverts expectations of what it means to be veiled. Being veiled becomes a metaphor for being invisible. The advantages one draws from invisibility, that is, a power long coveted by superhero fans, is now married to being veiled. Could it be then, that there are advantages to being veiled? Isn't invisibility all about seeing without being seen? A fanciful thought. If only to shift the way one conceives any veil. The other reason I have been fascinated by Batina is that I only read about her this year. And when I did, it made me realise why I so liked one of the female characters in my novel. She is in fact, the character that I prefer. She is headstrong, inquisitive, intelligent and very independent. And when I created her, I insured, perhaps to add to her mystery, that she would also wear a burqa. Over the years, while I wrote my novel, I was amused to find that my character's remarkable ability to intimidate others and her quiet strength in a world dominated by men (especially in the 15th century!) derived precisely from the fact that she was veiled. There is a character in X-men called Dust.. Thank you, Ali for your kind words and for taking the time to comment. I am really glad you enjoyed this article. I read about Dust, she is fantastic!